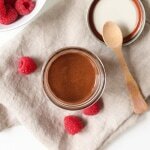 3 simple steps and 3 simple ingredients make up this better-for-you naturally sweet vegan nutella. I think I first tried Nutella in French class in school. And then proceeded to BEG my Mom to buy it for me at home. I think she might have caved in that first time but it’s not like we often had Nutella in the house growing up. And for good reason. It’s loaded with palm oil and sugar, high in fat, and pretty processed. Plus, the French Ecology Minister just said you should stop eating Nutella because of deforestation due to palm oil demand. But what if I told you that you could have the sweet nutty Nutella with just 3 simple ingredients, sans palm oil?? 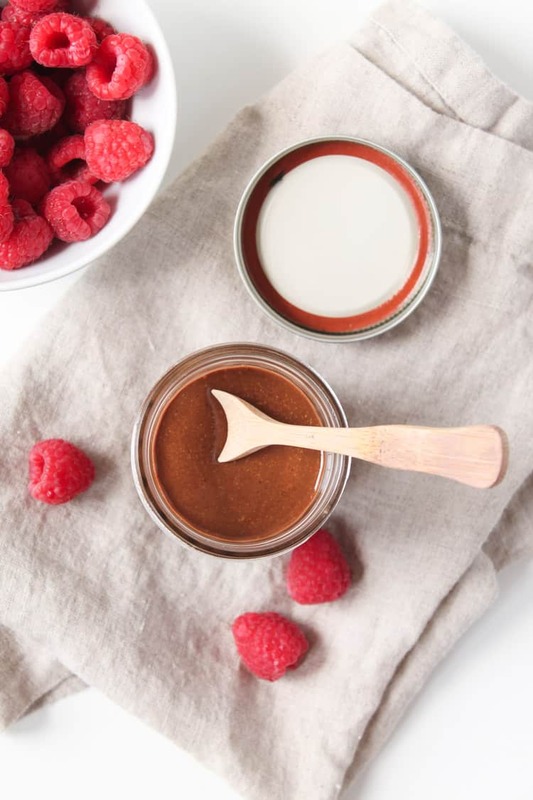 You can enjoy a homemade DIY version of Nutella by using toasted hazelnuts, dark chocolate, and coconut oil. 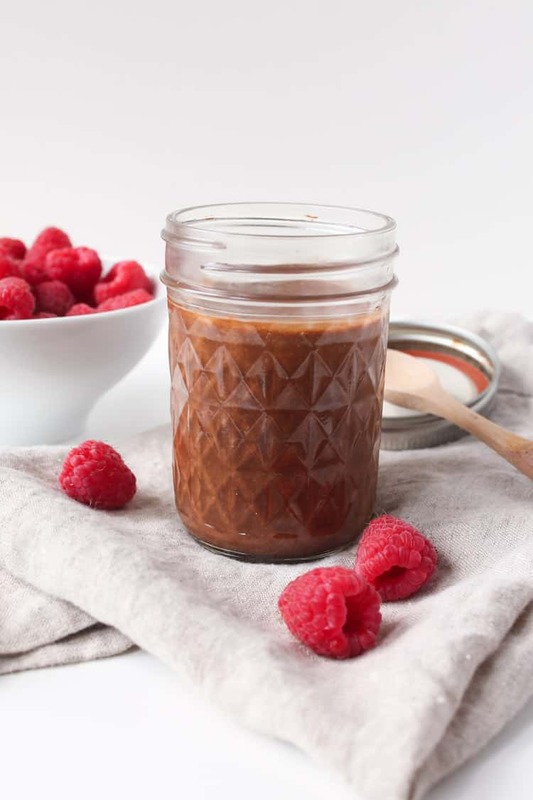 It may be a simple, easy, better-for-you recipe but it still packs in that delicious cocoa hazelnut spread flavor that we all love. Roast the hazelnuts and remove skins. Melt the chocolate and coconut oil. Combine it all in the food processor. For me, I thought the sweetness from the dark chocolate was enough but if you need a little something more, add a touch of agave nectar. This Nutella is packed with healthy monounsaturated fats and antioxidants. Win! 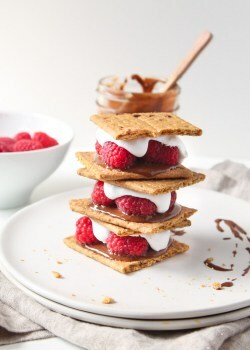 Spread it on whole-wheat toast or drizzle over fresh berries for a treat. Preheat the oven to 350 degrees F. Line baking sheet with parchment paper. Transfer hazelnuts to the baking sheet and roast nuts for 10-15 minutes, or until lightly browned. Let cool. With a kitchen towel, roll hazelnuts around on the baking sheet to remove the skins. Discard the remaining skins and transfer hazelnuts to a food processor and blend for about 5 minutes until the nuts form into a butter. In a small saucepan over low heat, melt dark chocolate chips and coconut oil. Transfer to the food processor with salt and pulse to combine. * Let cool. 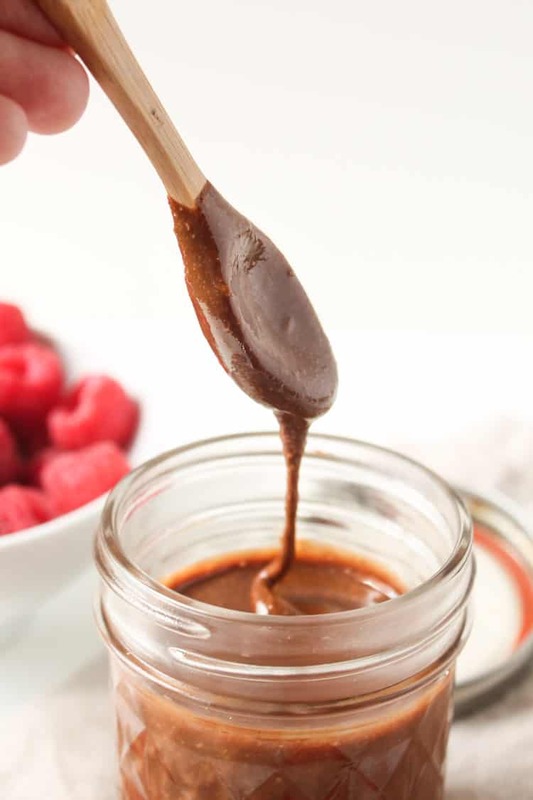 *If the Nutella isn’t sweet enough for your taste, try adding 1 tbsp of agave nectar. Tell me, have you ever made your own Nutella? What’s your favorite Nutella pairing? There are just some things you shouldn’t make and keep on hand – this is one of them!! I would eat the entire jar before it even got into the jar! So easy, yum! Wow, I LOVE nutella but never buy it because we all know what happens when you buy nutella- it ends up going on just about everything. String cheese & Nutella? Don’t mind if I do. This looks like the healthier alternative I need- yum! I love making my own nut butter… I’ve done almond, cashew (including chocolate) and pecan but not hazelnut… this is the smallest ingredient list I’ve seen yet so definitely going to try this one!! 🙂 Thanks, Cassie! Let me know what you think. Enjoy! STOP IT!!! This looks just amazing!! I cannot wait until I can make it! Thank you, thank you, THANK YOU! I will definitely be sharing this with clients! !